I am not a big fan of Varanasi as I have mentioned in my post the last time I visited. I didn’t really want to go back but it is one of the holiest and unique cities in India and my dear friend wanted to visit, and I think it does need to be seen to be believed, so back to Varanasi I went. From the train station to the hotel, Varanasi managed to unleash the worst she could on us. The crowded streets and chaos was everywhere, and it was all marked with a slight pink tinge as people prepared for the colourful festival of Holi. I felt so sorry for my friend, she was still only 3 days into her first trip to India and here she was dealing with the chaos of this town with such grace. After a long and rather confusing walk through the back alleyways of old Varanasi we made it to our hostel, situated on the Ghats. Peace could again start to be restored as we looked down at the Ganges flowing before us. Looking at the ghats from a distance Varanasi can be beautiful, but being close up and walking through them again I remembered just how filthy and distressing this town was. There are some small moments which are fun, like watching the children play cricket. 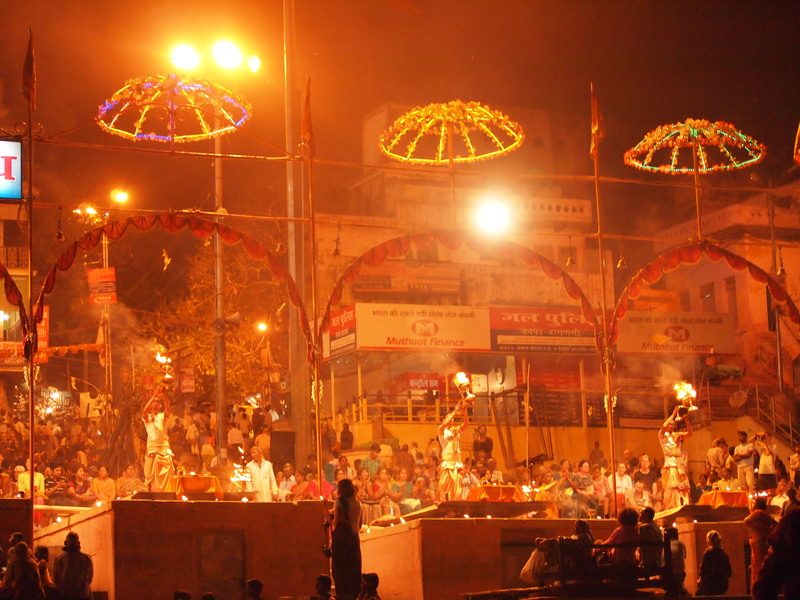 The night aarti was spectacular and certainly worth seeing in Varanasi. Its a religious ceremony, but here it feels more like a show. We took a boat and docked right in front of the main ghat at dusk and awaited the the show. Seven priests line up along the shore and do their prayers for the crowd. There is a fire, smoke and song, it feels like we are in a spiritual place, for at least a short I can forget all the dirt, dead bodies and pollution I have seen during the day. The next day we awoke to a lock-in. I was Holi, the festival of colour and our hotel had shut its doors until 1pm to keep its guests safe. This was to be my first Holi in India and I had been looking forward to it, I had visions of children laughing as they threw coloured powder on each other in good natured fun. 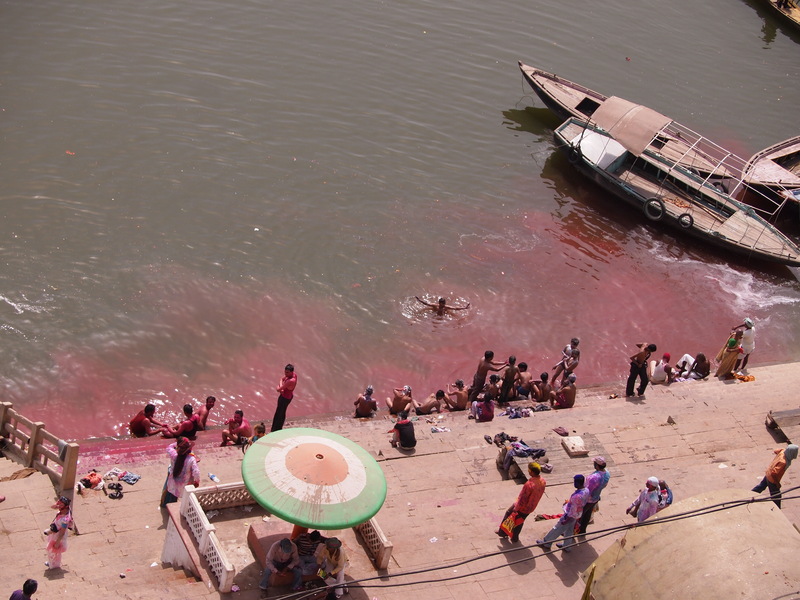 Unfortunately this doesn’t seem to be what Holi is, at least not in Varanasi. From the balcony of our hotel we looked down at groups of young men walking along the ghats, some had the faces painted in silver and wore funny hats, all were covered in colour. 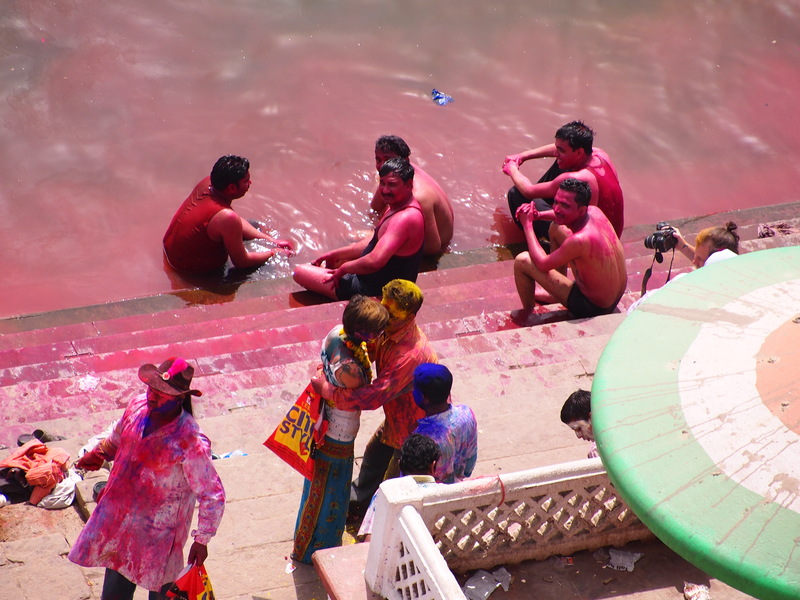 Some had already started to congregate by the water to wash off the colour from their clothes and skin. It all looked relatively calm and innocuous, but the distinct absence of women was certainly noticeable. 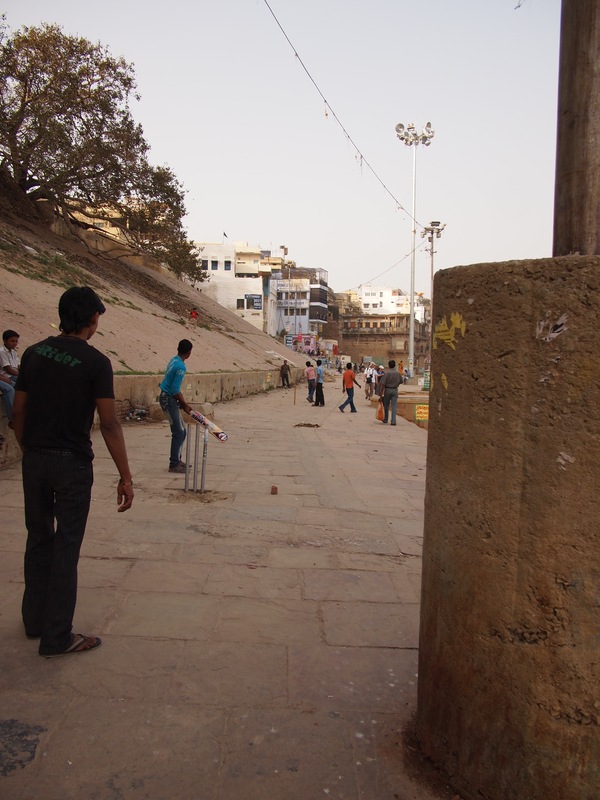 After the lock-down was over we took a walk along the ghats to see what Holi was all about. The danger quite quickly became apparent, we walked onto one ghat only to see policeman hitting some boys with a stick and warning others to stay away. The melee cleared after a few minutes and it seemed peaceful again so we kept walking along. Groups of young boys, mostly now in their underwear, were walking along, some looking obviously inebriated and most were particularly more leery than they had been previously (which was already rather bad). Some held out their hand, came a bit too close and tried to shake hands with us. Unfortunately my time in India has taught me to be rude to groups of men and I tried to ignore them, but this can be difficult particularly on the narrow steps with little room to move away quickly. It all felt seedy, a little unsafe and unsavoury. I was disappointed, I had looked forward to seeing this festival and enjoying the colours but now its just left me with a rather bitter taste in my mouth, certanly not something I wish to experience again. I am not sure if this is just in Varanasi, or more pervasive across India. Its a real pity, what could have been such a beautiful and joyous occasion now seems to be a reason to harass women in packs and misbehave. So for a second time I leave Varanasi with no plans or wish of ever returning. Also, as for Varanasi generally, anybody expecting a picnic, or spectacular views will never be able to appreciate the unparalleled spiritual significance of this place. The problem that many foreign and Indian ‘tourists’ find Varanasi unpalatable is because they are treating it as a picnic spot, without understanding the spiritual significance of the place. Advice to them, please don’t come. Thanks for your comments. To be honest I can’t think of anywhere in the world I would be least likely to have a “picnic” than Varanasi! I think you will find that many foreign tourists who choose to go to Varanasi, do so to learn about the spiritual significance of the place. What could have been a friendly festival with friends and relatives, is becoming a nightmare festival for people. It is not only there, even other parts of India(mostly North), it could be so. I have not been Varanasi, and what I hear, I request the Lord Viswanth and Annapoorna Devi to bless me, as I bow to them!